Summary: The film, Tsotsi, set in Johannesburg and Soweto, shows six days in the life of a young man in a gang. Tsotsi, which means “thug” or “gangster” in a South African dialect, is the name the hoodlum gives himself. In the beginning of the film, he steals a car, accidentally shoots the woman driver, and unexpectedly finds her infant in the back seat. He decides to take care of the baby and we see how this humanity changes his life. 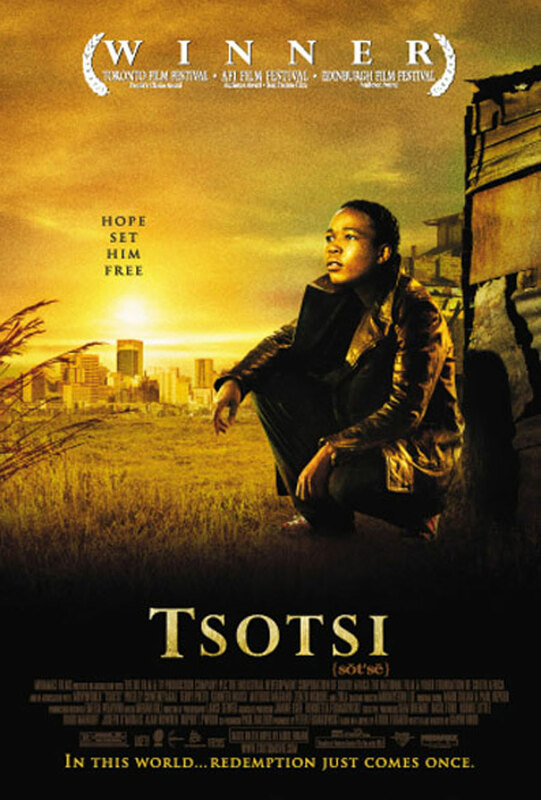 Tsotsi, orphaned at an early age because his mother died of AIDS, is compelled to fight his way alone through life. He hardens himself against emotion, represses all memory of his past, and takes another name. He forms a group of hoodlums, makes himself the leader, and exists as an angry social misfit until he begins to feel emotions. Violence defines his world and it is violence and its consequences that catapult the story line. Tsotsi’s story is an inner psychological journey of self discovery in which he learns the importance of giving and the value of redemption. The film is based on the best-selling novel, Tsotsi (1980), written by the South African playwright and novelist, Athol Fugard.